Mr. & Mrs. Earl Brody on the birth of a great-grandson. Mr. & Mrs. Alan Gold on the birth of a grandson, born to Naftali & Adina Wein. Shalom zachor is from 8-10pm at the Golds, 2922 W. Lunt. Bris is on Monday after the 6:15 Shacharis at Bais Chaim Dovid. Rabbi & Mrs. Bill Kanter and Mr. & Mrs. Mike Nussbaum on the birth of their grandson, born to Rabbi Daniel & Mrs. Rayli Kanter. Shalom zachor is at 8 pm at the Kanters, 2909 Farwell. Bris is on Monday after 8am shacharis at Yeshurun. Mr. & Mrs. Avrum Reifer on the birth of a great-granddaughter in Eretz Yisrael. The 8:20 Kiddush is sponsored by Rabbi & Mrs. Mayer Simcha Stromer on the occasion of his grandmother's yahrtzeit. Mr. Joseph Nagar on the occasion of his father’s yahrtzeit. Yeshurun was saddened to hear of the passing of Miriam Maita Sadoff a"h, mother of Jerry Sadoff. Shiva will be at 6527 Mozart Apt 1b. 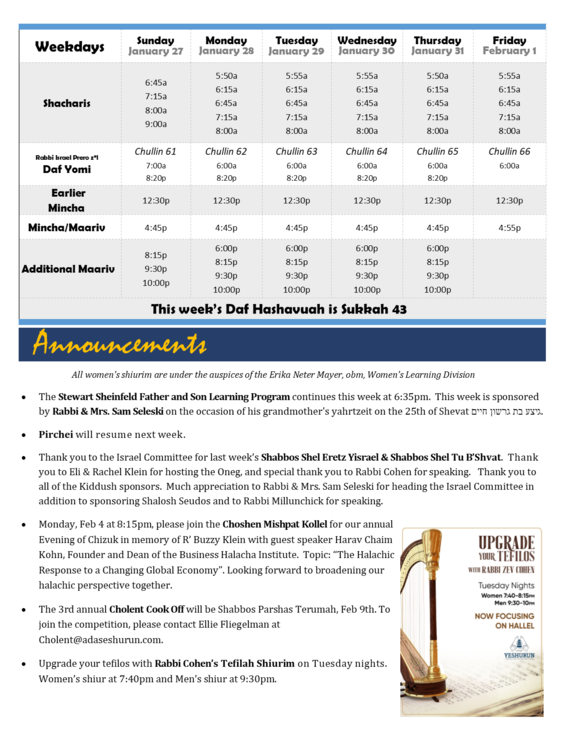 Thursday 1/24 & Sunday 1/27: Shacharis 6:45am & Mincha/Maariv 4:40pm. Friday 1/25 Shacharis 6:45am. The Stewart Sheinfeld Father and Son Learning Program continues this week at 6:35pm. 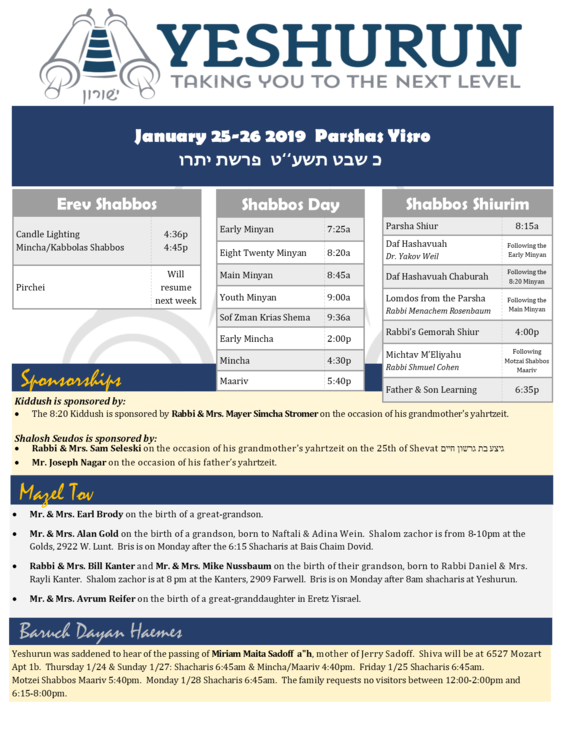 This week is sponsored by Rabbi & Mrs. Sam Seleski on the occasion of his grandmother's yahrtzeit on the 25th of Shevat גיצע בת גרשון חיים. Pirchei will resume next week. Thank you to the Israel Committee for last week’s Shabbos Shel Eretz Yisrael & Shabbos Shel Tu B’Shvat. Thank you to Eli & Rachel Klein for hosting the Oneg, and special thank you to Rabbi Cohen for speaking. 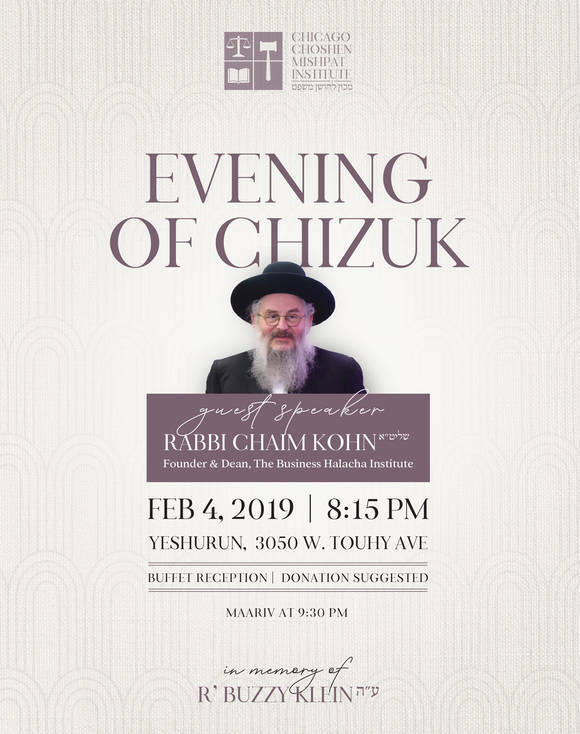 Thank you to all of the Kiddush sponsors. Much appreciation to Rabbi & Mrs. Sam Seleski for heading the Israel Committee in addition to sponsoring Shalosh Seudos and to Rabbi Millunchick for speaking.